Savannah, GA, is one of the most lovely and historic cities in the Southeast. When visiting, you won’t want to miss out on anything! Savannah walking tours are ideal for couples, families, and groups and offer an authentic and entertaining experience you won’t forget. Don’t lock yourself in a museum when the sun is shining bright; put on some comfy shoes and roam the streets with a guide! Read on to find out about our favorite tours and start planning your trip today. The Savannah Stroll is the perfect tour for those who are discovering the city for the first time. Explore the rich cultural past of Savannah, from the time of its founding to today, and learn interesting facts about the town’s history and culture. On top of historical knowledge, your guide also provides precious tips on where to find the best restaurants and secret viewpoints that only locals know about! This one is for history buffs! Savannah Walks offers a Civil War Tour where you can visit the houses of Confederate generals like William Hardee, James Bartow, and even Joseph E. Johnston. See the home William Sherman used as his headquarters during his occupation of the city and learn all the strategies used in Georgia at the time! Savannah’s history is diverse, and African American culture is a huge part of it. Slaves contributed to building the city and making it one of the best in the South. To learn more, go on a Black History Tour like 40 Acres and a Mule. This 2.5-hour adventure takes you through six downtown squares and tells the story of slave’s path to freedom. It’s an absolute must-do! If your favorite holiday is Halloween, then the Savannah Walks Ghost Tour is made for you. Learn about local legends and haunts as you walk by colonial houses in the historic district. If you want to make it even spookier, take a twilight stroll beneath the Spanish moss and listen to old Gullah tales! 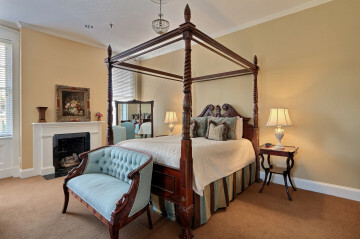 After spending the day roaming around Savannah, come home to a comfortable room at Presidents’ Quarters Inn. Our luxurious accommodations are simply stunning and are perfect for that romantic getaway you’ve been talking about for months. Experience the Southern charm at our elegant and sophisticated Inn and forget your everyday worries. Book our Dwight D. Eisenhower Suite! This spacious yet cozy queen bedroom is one of our most popular suites. Relax and take a hot shower in your private bathroom, then nestle up on the antique mahogany day bed with a good book. You’ll get the best night of sleep you’ve had in a while! Wake up the next day feeling refreshed and join us downstairs where a delicious homemade breakfast awaits you.